There was then a gap of some twenty years, before Jack Parkinson (late 67th Regiment) formed the ‘new’ Old Comrades Association. 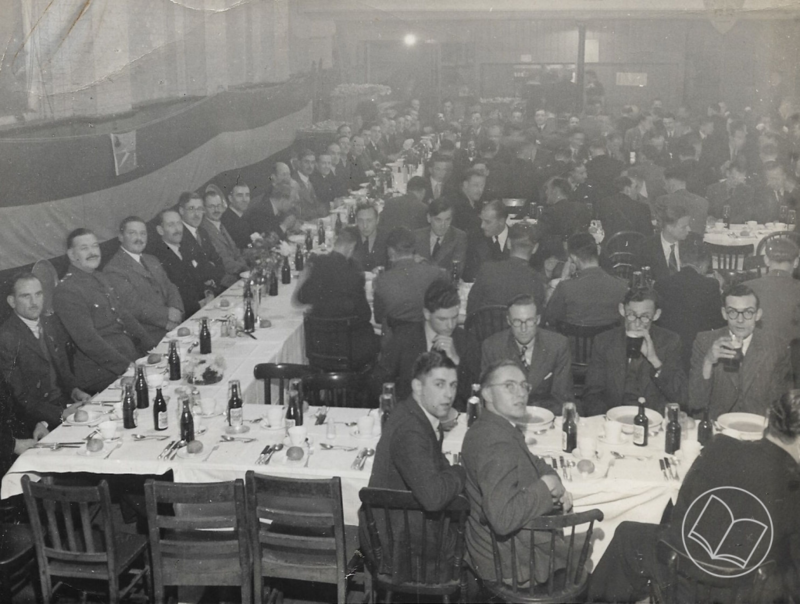 The initial members were from the 67th who responded to an invitation from the Station Commander of RAF Biggin Hill to attend the 40th re-union of personnel who served there during the summer of 1940. But the association was open to anyone who had served in the 5th East Surreys and/or the 57th and 67th. Jack stated at the time that, ‘The main purpose of the exercise is to contact as many of our old mates as we can. We are finding old pals who are sick (some quite seriously) who would be delighted to have the odd phonecall or letter’. To keep everyone in touch, especially those living further afield, Jack introduced a monthly newsletter in June 1981 and it continued regularly for over ten years, and occasionally thereafter. In the latter years Jack found it increasingly hard to write any obituaries, but his tribute to Bert Ware in November 1991 also reads like a homage to the pre-war Wimbledon Territorials. Together with the Companies of the old 5th East Surreys in Streatham, Sutton and Epson/Leatherhead, they formed the backbone of the two new anti-tank regiments. Bert served in 226 Battery of the 57th in France and Belgium 1940 and, despite being a non-swimmer, was evacuated from the Dunkirk beaches with his old friend Jock Giles. Jack wrote: News of Bert Ware’s death reached me just as l’d finished typing the last letter, and so I was able to squeeze in a postscript to let you know. However, I can’t let Bert’s departure from our little group be noted by such a brief line, because he was much more than a bloke a few of us knew and with whom we shared the odd half at the Manor. For some (myself included) Bert goes back to childhood days, to school in the old building which still looks exactly the same, to trying to get jobs and keep them during the thirties, and to the dusty, rough-and-tumble evenings at the St. George's Road drill-hall. Somewhere along the line came winter trips to skate and slide on the Wimbledon Common ponds, and summer outings to long-forgotten places with local Church organisations, and early girlfriends - whatever happened to them? And then came 1939, when we split after Camp, and next year while some of us, manning the airfields, could hear the rumble of guns on the wind from France - where our pals were immobilising the little 2-pdrs we'd all been training on, and heading home on Shanks’s pony. Many of us have only heard how they fared during those days over a drink at the Manor, these past few years, when we've heard from Bert, and Jock, Bob, George, Stan, Roy, and the others just how it was. After the war, I ran into Bert a few times while visiting my parents, and we had lunch together one day at the old Raynes Park Hotel, but we didn’t keep in touch. So it was great to see him again, when Jock brought him along to the ‘Demo’ in the Merton Road some years ago, and the years rolled back. It’s hard to say just what made little Bertie so special, and it’s not just old associations; he was a cheerful, philosophical, tough little guy who made under-statement a fine art. Even when he was so very ill, we always believed he'd recover like he’d often done before. We got a poppy-wreath for him, and Jock, Stan, Jim Knox, and I saw him off at Garth Road crematorium on 11th September. So sad. The split Jack refers to is the formation of the 67th in June 1939. While new recruits were in the majority, a number of experienced NCOs from the 57th were posted to carry out training in the new Regiment. This separation was felt keenly by these men, who almost overnight lost friendships formed during the pre-war years. 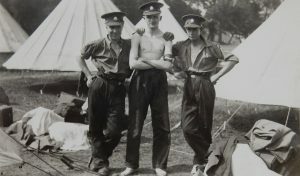 Bert Ware (right) with 'Ginger' Reeves and Bill Pryse at one of the pre-war annual camps. Reproduced by permission of Surrey History Centre. Copyright of Surrey History Centre.